This new stand-alone recorder from Tascam records a variety of high-resolution audio formats directly to DVD discs. When recording an important or unrepeatable concert or performance, it is often a wise policy to record the mix to at least two separate machines — a main and a backup — just in case. In days of old, that might have meant two independent analogue tape recorders, and more recently it might have involved a computer-based system as the main recorder and a DAT or CD-R machine for the backup. However, these last two formats are normally restricted to 16-bit resolution and 44.1kHz or 48kHz sample rates. There is a growing number of flash-memory recorders that can now fulfil this role, but large-capacity Compact Flash cards are still far too expensive to employ as an archive format. Hard drives aren't cheap, or particularly portable either, which leaves various optical disc formats — in particular the recordable DVD. 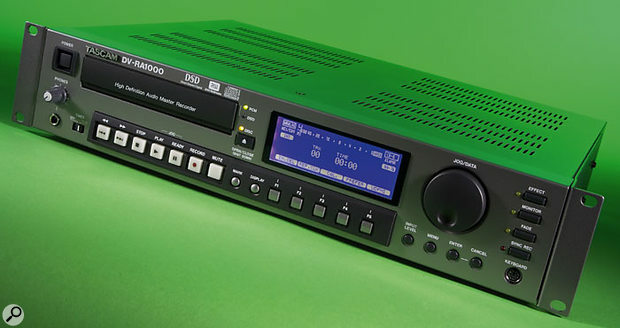 Enter the Tascam DVRA1000, a DVD recorder optimised for the recording of high-resolution stereo audio. Think of it as a grown-up stand-alone CD-R recorder, but one that supports standard stereo digital PCM signals from 16-bit, 44.1kHz up to 24-bit, 192kHz, as well as stereo DSD signals. Standard audio CD-Rs (and CD-RWs) can be burned directly with 16-bit/44.1kHz signals, and everything else is burned onto single-sided DVD+RW discs. There are a lot of different DVD-style recordable disc formats, and it should be noted that the DVRA1000 cannot burn onto DVD+R, DVD-R, DVD-RW, or DVD-RAM discs. The maximum file size is limited to 2GB, which allows about 30 minutes of stereo for 192kHz PCM on a standard disc, increasing to just over an hour at 96kHz and two hours at 48kHz. Switching to the DSD format allows about 50 minutes of stereo per disc. The unit is a 2U rackmount machine looking much like any other professional optical disc recorder, with obvious transport buttons and a quintet of keys relating to the display menus. If you've used a CD-R machine, much of the DVRA1000's basic operation will be familiar. However, something which is novel is a built-in effects processor that can be allocated to the recording or playback paths. The processor provides a three-band equaliser (with shelving top and bottom sections, and a fully parametric mid-section), followed by a configurable dynamics process that can be set up to operate as a single-band or a three-band device, with compression and expansion algorithms. Clearly, these facilities have been incorporated to allow a degree of 'mastering' to be performed, which could be useful on occasions. The front panel looks fairly clean and simple, although the nature of the machine is such that its detailed operation involves quite a lot of inherent complication in terms of the setup and configuration. Much of this is hidden away most of the time and is accessible either via a 'virtual front panel' on a large backlit screen, or from the dedicated buttons on the wired remote. The machine's rear panel carries XLRs for balanced analogue line level (+4dBu) signals in and out, as well as phono sockets for unbalanced (-10dBV) connection. On the digital interface side, there are phono sockets for S/PDIF in and out, plus dual XLR connectors to enable double-wire hookups for high sample rates. Digital signals up to 96kHz can be connected using one (double-speed) or both (double-wire) AES sockets, but quad rates (176.4kHz and 192kHz) must use the double-wire format. DSD signals can be hooked up using a quartet of BNC connectors (individual sockets for each channel in and out), in the SDIF 3 or DSD-Raw formats. Three more BNC connectors take care of word-clock in, out, and thru, and there is also a USB connector to allow direct connection with a PC for downloading of the recorded data. Two remote-control options are provided, the first via a supplied wired remote control unit which connects using a mini-jack plug, and the second via an RS232 serial port. The onboard signal-processing features are set up using a dedicated menu screen which shows a graphical representation of the signal path. Starting at the left, the first section shows where the processing has been inserted in the play or record paths of the machine. Next is the input level control — an attenuator intended to prevent overloads if EQ gain or upwards expansion are introduced. The EQ and Dynamics sections are represented by simple on/off tickboxes, each followed by a bar-graph meter to show the signal levels feeding the next section. Finally, there is an output attenuator with the same parameters as the input attenuator. The first 10dB of attenuation is adjusted in 0.5dB steps, with 1dB steps from there on to -72dB, followed by a mute position. Soft keys under the overview menu screen described above provide direct access to the EQ and Dynamics submenus. The EQ is a simple three-band design with soft keys to select the required band and parameter, while the data wheel is used to change the selected value. A graphical frequency-response chart illustrates the current EQ settings, along with an output-level bar-graph meter display, and the specific parameter values for the selected band are detailed on the left-hand side. The dynamics window has a similar graphical arrangement, with the output meters on the right, a transfer graph or crossover graph in the centre, and selected parameter values on the left. Again, soft keys are used to navigate around, and the data wheel changes values. In the first screen, the user can select the mode (compressor or expander, full-band or three-band) and adjust the crossover frequencies in the case of a multi-band effect. Accessing each band then shows the relevant transfer curve complete with an input-level bar-graph and a gain-reduction meter, in addition to the permanent output-level meter. On-screen controls are provided for the threshold, ratio, knee, gain, and attack and release times. It is possible to work out most of the machine's operation intuitively, but reading the handbook first makes life a lot easier, because there is a great deal of functionality on offer. My first experiments were to use the machine to record standard 16-bit, 44.1kHz audio onto a familiar CD-R disc. Selecting the analogue inputs and setting levels was straightforward, as was starting recording for each new track. Track increments can be performed manually or automatically — the latter based on an adjustable threshold level or a PQ flag when recording from suitable digital sources. Finalising the disc was also simple enough and quite quick. Photo: Mike CameronMoving up to the high-resolution formats, the only real difference is deciding on the data format required — PCM or DSD. From a practical point of view, editing and processing DSD files is restricted to a small number of high-end professional workstations, so most of us will probably find it easier to stick to the high-resolution PCM formats. It should also be noted that, although DSD data is the basis of the SACD disc format, the DVRA1000 machine cannot burn SACD discs — that process is restricted to a select number of commercial disc-production plants. The Tascam machine simply stores the PCM or DSD data in a standard UDF disk format as WAV or DSDIFF files. These can be read by any computer, even if the computer may not be able to play it directly. The only exception to this approach is that 16-bit, 44.1kHz audio files burned to CD-R are encoded as an Orange Book audio CD. A standard PS2 keyboard can be plugged into the front panel to allow text entry for project/file naming and that kind of thing — far easier than trying to do it using the cursor keys! Basic editing functions are provided, with the ability to divide or join files. Files can then be sequenced in the required order by building a playlist — crude and fiddly, but probably useful in an emergency. Obviously, far more controlled and accurate results will be obtained by editing the files on a suitable audio workstation — either by loading the DVD+RW disc directly into another computer, or by accessing it in the machine via the USB interface. Incidentally, when accessed via the USB port, the machine's internal drive can be used to read a wide variety of additional disc formats, including DVD+R (single and dual layer), DVD-ROM, DVD-R, and DVD-RW. The pretty much universal move into high sample rates and 24-bit files on computer workstations left us temporarily with few options for a stand-alone mastering/backup recorder. Tascam have addressed that need comprehensively with the DVRA1000, and I'm sure other manufacturers will follow the company's lead very quickly. The DVD+RW format is affordable, convenient, and reliable if used and stored sensibly, and offers realistic recording and playing times for stereo material. The machine itself is easy to use, and the analogue I/O sounds very good indeed, allowing the DVRA1000 to serve well as a stand-alone high-resolution analogue recorder. For the highest possible quality, top-flight external converters can be hooked up easily using the AES or SDIF3 interfaces, enabling the machine to serve as a pure data recorder. At present, I back up and archive high-resolution material on the increasingly antiquated MO disc format using my Genex multitrack recorder, but the days of this media must be limited. I liked the DVRA1000 a lot, from both operational and sound-quality viewpoints, and I will be giving it very serious consideration indeed when the Genex and/or MO media come up for replacement. Choice of PCM or DSD data formats. Restricted to the DVD+RW disc format. A timely and well-designed replacement for the DAT or CD-R that is capable of supporting high sample-rate, 24 bit audio. Records to DVD+RW discs in UDF computer-readable format with WAV and DSDIFF files, as well as producing Orange Book CD-Rs if required.